Despite its name, Hardanger isn’t really hard at all. The technique originated in the Hardanger region of Norway. The scary bit of hardanger is having to cut the fabric threads to produce the lacy effect, but take it gently and try our online class first, then start with the small, beginners pieces and you will soon forget your initial fears and be brave enough to move on to larger more complex projects. 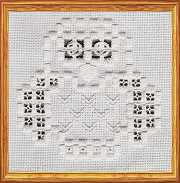 The hardanger designs are, at present, only available as charts. Hardanger is normally stitched on 22 count fabric in Perle cotton. Some of our designs have been stitched on the finer 28 count fabric and we have also used Oliver Twist’s Hardanger Hanks. If you would like to see some other ranges of hardanger designs, which are available as full kits, click on the image below to be taken to the web-site of some friends of our!